1m Trees is a joint program by German NGO Fairventures Worldwide and the local foundation Borneo Institute in Central Kalimantan, Indonesia. The aim of the program is to revitalize deforested and degraded land with multi-species agroforestry system, utilizing the soil-improving qualities of pioneer species such as Paraserianthes Falcataria and Anthocephalus Cadamba to create a basis for the cultivation of fruits and vegetables. In a second step, the fertility of the areas is further enhanced with compost and permaculture techniques. The livelihoods are then diversified by planting fruit trees and timber species with longer rotations. The fast-growing timber can be harvested after 5-8 years, is relevant for the wood industry and provides a livelihood for the local population, while the vegetables and fruit improve nutrition and food security. The traditional livelihoods of the local population are swidden-fallow agriculture (also known as or slash and burn), hunting, fishing and foraging in the forest. This livelihood model was sustainable with small population numbers on a completely forested Borneo. Today, more population shares less forest, swidden-fallow cycles are shorter and the forest does not have the chance to regenerate. Government regulations outlaw the burning of the forest without providing alternatives. Game and fish catches are decreasing. Even basic vegetables are imported from other islands. Communities have little access to health and education on site. On paper, the situation looks better, as most people in the project area at least have between 1 and 2 Dollar per day available to them due to sales of rubber (relatively poor). But with further environmental degradation, life in these areas will eventually become unsustainable. The solution to the problems described above had to be a land use system, that a) functions sustainably in degraded areas with poor soil, b) generates enough income to make further mining, illegal logging or conversion to palm oil plantations unnecessary, c) can be implemented by small holders with little disposable income and d) is in line with government regulations. A model of multi-species agroforestry systems, with fast-growing timber as an income source and fruits and vegetables as sources of nutrition is the solution. The approach has a heavy focus on the improvement of soil quality. Since Kalimantan has little agricultural infrastructure, local nurseries had to be established, as well as an intensive course program covering best practices of planting, maintenance, and harvesting of the main species as well as financial and organizational aspects. Farmers had to change their behavior drastically, from shifting cultivation with relatively little farmer input, to constant work and improvement of the same small plots, from individual work with little regard to environmental consequences to a holistic approach on community and landscape scale. The resulting fields provide habitats to insects, birds, and small mammals. Pest control has been accomplished by fences around the vegetables and organic agents. The decrease in chemical fertilizer use has the effect that rivers are less affected by fertilizer run-off. The target areas were degraded and not feasible for agriculture before, safe for an agricultural model unsuited to smallholders and heavily reliant on chemical fertilizers. By identifying combinations of plants that work well together and applying a number of natural improvements to fertility, the fields have been revitalized. The first key step was the planting of Paraserianthes Falcataria, a fast-growing pioneer species, that requires little nutrition, improves the soil with nitrogen fixing, combat erosion and generates income for the famers. In the next step, additional plants, such as timber species with longer rotations, vegetables and fruits have been planted, based on a field-by-field analysis of soil, water and environmental conditions. The planting has been facilitated by further soil improvement through compost and mulch. Each planting cycle, additional plants were and still are added, and the best practices get updated, as we gather more data. An additional component, focused on the wood-processing industry was implemented to ensure demand stays stable and farmers have market access. Cooperation with companies meant, that the farmers could be convinced to participate, as a buyer was ready. The key factor to a successful implementation was a strong focus on community work. Since the farmers were operating at their own risk, the community engagement based on FPIC standards had to be intensive, credible and open towards suggestions, complaints and input. Convincing the first farmers was the hardest (65 in the first year), but then people saw first results on the fields and joined in greater numbers. One major obstacle was the complete absence of land titles in the communities. All land belongs to the state forest estate. Currently, applications for transfer of ownership to the communities are under way. In the past, close cooperation with the government was important to reach a certain level of security. Since the beginning of the project, we have cooperated with a number of different stakeholders in forestry, agriculture, education and public administration. An important partner was the provincial forestry agency (Dinas Kehutanan Kalimantan Tengah), providing support to the project and input for scaling, land rights issues and lisences). 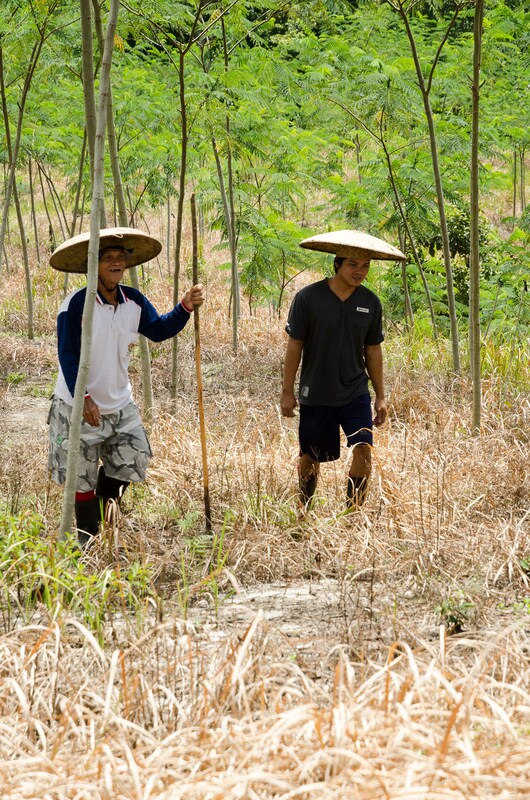 The project has also implemented activities along the value chain of the timber in cooperation with companies (PT Albasia Bhumiphala Persata, PT Sumbermas Plywood) from the wood-processing industry, ensuring farmers have a buyer for their timber. In addition, product innovation and export promotion activities contribute to the transformation of the sector towards sustainable resource use. Currently, cooperation with buyers for the agricultural products is under exploration. Cooperation with educational institutions on different levels was initiated in order to strengthen local capacities in regard to forestry, agriculture and sustainability. Farmers recived training in technical and financial matters, students from the local university (UNPAR) and agricultural school (Sekolah Pertanian Tumbang Lahan) were included in project activities, and capacity building for the public sector was always a part of the project. The target area is characterized by a mosaic of deforested and degraded land, biodiversity-rich secondary forest and smallholder fields. The main challenge was to identify an economic solution, that utilizes the deforested parts for income generation. The income thus generated would have to suffice for the farmers, so they would not extend their cultivation area, on one hand, and disincentivize large-scale land use chance by external actors (palm oil etc.) by keeping the fractured nature of land use intact. This was accomplished. The model described above increases biodiversity in the area, strengthens resilience against climate change on a landscape scale and prevents erosion and further degradation on individual plots. The rehabilitated areas are suitable habitats for many diffenert animal species and serve as corridors between areas with intact forest. The project started by addressing farmers individually, as no organizational structures were present in the target area. Through the activities of the project, farmer groups were formed. In addition, the team facilitated the first community discussions on land use, deforestation and biodiversity. The farmers are now more confident and knowledgeable and can decide on such matters with a wider perspective and better information basis. Due to the redirection of economic activities to formerly degraded land, a small stream and the surrounding forest was protected by the community, providing a source of fresh water. Other rivers are less polluted due to a reduction in fertilizer run-off. Fruits and vegetables, that were imported from other islands (Java mainly) were substituted by local production. The consumption of healthy fresh fruits and vegetables has increased as it is no longer necessary to purchase them. More variants of fruit and vegetables are available in the target area, contributing to a diverse diet. The activities described above generate an income for the famers that is above the average household income in Indonesia, let alone in Central Kalimantan. The farmers have received financial training to enable them to calculate costs and benefits and will be able to fund the next planting cycle independently. The agroforestry system in use absorbs at least 50 tons of CO2 per hectare during each rotation, therefore the project will sequester more than 50.000 tons upon completion. This does not include the increase in ground carbon storage and the reduction in deforestation in the project area and Indonesia in general. The project is now in its 4th year. So far, funding has come from international grants, but this will change over time. The key moment will be the first harvest of timber, which will provide the communities with an income that outweighs the investment needs for replanting by far. In addition, the data and mapping generated by the project so far is an excellent basis for investment-driven expansion. Potential investors could be green investment fonds, individuals or the very timber companies that are interested in a continuous supply. Once a well-running system for investment is in place, the extension and/or renewal of planting areas is relatively easy, as farmers only need external support for their first planting cycle. The early stages of the project were expensive, as no one has ever tried something similar in Central Kalimantan. Growth data etc. about most of the plants was not available for the target area. The project has responded by intensive data collection, and is currently working on an even more comprehensive online tool for data gathering and distribution to all stakeholders, such as farmers, government agencies and the private sector. The project costs will amount to ca. 3m Euro once the all pieces are in place. At this level, expansion could be fueled by investment, f. ex. by companies interested in purchasing the outputs. In Kalimantan, negotiations with wood-processing companies and agricultural buyers have reached an advanced level. The project has been designed in multiple stages: pilot activities in Kalimantan, data gathering and analysis to build a case for scale-up, search for investors to reach out to more farmers and into other regions. A potential site would be situated in a tropical country with degraded areas. To expand, a local partner with strong connections to communities (for pilot activities) and the government (to address land use and ownership issues) would have to be in place. Funding needs to start activities would be ca. 2m Euro for a first phase and to reach the stage, where activities can continue through commercial investment. New locations will be more cost-efficent through the new tool.